Plaque Attack - Spray away plaque, tarter bad breath. Works on both dogs and cats. 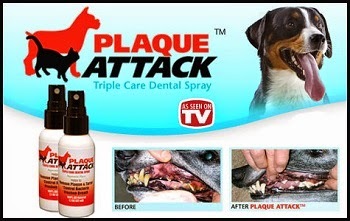 Plaque attack triple care dental spray for your pets. PLAQUE ATTACK uses only all natural human grade ingredients which safely combine with saliva to break up bacteria, plaque, and tartar which cause bad breath and gum disease. Just one professional teeth cleaning can cost hundreds of dollars! PLAQUE ATTACK will only cost you pennies a day! Great for both dogs and cats of all sizes. It's easy to use, just spray in your pets mouth. Spray in your pet’s mouth and PLAQUE ATTACK’s all natural formula quickly and safely mixes with saliva to coat the teeth and gums. Here is a good reason to try plaque attack. 4 out of 5 dogs will get gum disease in their lifetime! Gum disease can lead to more severe infections in the heart, kidney, and liver of your beloved pet. Style Snaps are the world's first snap and hem solution. Style Snaps - This is the world's first snap adjustable hem solution and it's being offered to you as a great way to save on costs of running a family. Style Snaps is so easy to use and its unique adhesive makes them adjustable, reusable and safe on any fabric. Just Peel, Place and Snap! Change Your Hem To Whatever Length You Want! Style snaps can hem your pants easier than pulling out the sewing machine. Anyone can use style snaps. Featured in InStyle, This offer is not available in stores!